Attributes: Gluten Free, Kosher, Natural or Organic Ingredients, Specialty ProductIngredients: Asiago, Parmesan, Cheddar, Swiss Cheese (pasteurized milk, salt, cheese culture enzymes), Nonfat Dry Milk, Whey, Buttermilk, Citric Acid, Sea Salt. .. 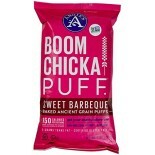 Attributes: Gluten Free, Natural or Organic Ingredients, Specialty Product, Wheat FreeIngredients: Organic Heirloom Non-GMO Popcorn, Organic Agave Nectar, Brown Sugar, Butter, Pumpkin Seeds, Organic Spices (Chipotle, Cinnamon, Ancho, Cumin, Allspice), Coconut Oil, Baking Soda, Sunflower Lecithin, Se.. 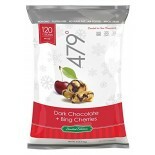 Attributes: Gluten Free, Natural or Organic Ingredients, Specialty ProductIngredients: Organic Non-GMO Popcorn, Organic Agave Nectar, Brown Sugar, Butter*, Bing Cherries, Palm Kernel Oil, Cocoa Powder, Cherry Extract, Coconut Oil, Whole Milk*, Baking Soda, Sunflower and non-GMO Soy Lecithin, Sea .. 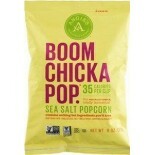 Attributes: Gluten Free, Kosher, Natural or Organic Ingredients, Non-GMO Project Verified , Specialty ProductIngredients: Organic Heirloom Non-GMO Popcorn, High Oleic Sunflower Oil, Nutritional Yeast, Herbs and Spices (Chives, Dill, Parsley, Rosemary, Garlic, Onion), Sea Salt, Citric Acid. .. 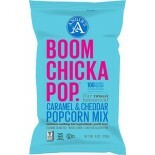 Attributes: Natural or Organic IngredientsIngredients: Organic Heirloom Non-GMO Popcorn, Organic Agave Nectar, Brown Sugar, Butter*, Pecans, Organic Spices (cinnamon, nutmeg, allspice, ginger, mace, cloves), Coconut Oil, Baking Soda, Sunflower Lecithin, Sea Salt.Nutritions: Calcium(2), Calories(1.. 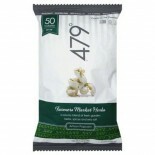 Attributes: Natural or Organic Ingredients, Non-GMO Project Verified , Specialty Product, Wheat FreeIngredients: Organic heirloom Non-GMO popcorn, high oleic sunflower oil, sea salt. Nutritions: Calcium(0), Calories(140), Cholesterol(0), Dietaryfiber(3), Fromfat(65), Iron(4), Protein(2), Saturatedfa.. 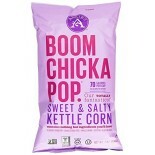 Attributes: Gluten Free, Natural or Organic Ingredients, Specialty Product, Wheat FreeIngredients: Organic Heirloom Non-GMO Popcorn, Organic Agave Nectar, Brown Sugar, Coconut, Coconut Oil, Butter, Baking Soda, Sunflower Lecithin, Sea Salt, Natural Coconut Flavor. .. Attributes: Gluten Free, Kosher, Natural or Organic Ingredients, Non-GMO Project VerifiedIngredients: Organic Heirloom Non-GMO Popcorn, Sesame Seeds, Seaweed, Chia Seeds, Sea Salt, Sugar, Spices (Chill, Orange Peel, Japanese Pepper, Ginger). .. 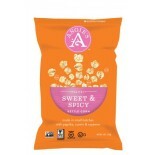 Attributes: Gluten Free, Kosher, Natural or Organic Ingredients, Specialty ProductIngredients: Organic Heirloom Non-GMO Popcorn, Organic Agave Nectar, Brown Sugar, Butter, Coconut Oil, Baking Soda, Sunflower Lecithin, Sea Salt. .. 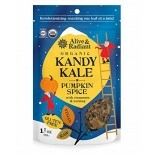 Attributes: Gluten Free, Natural or Organic IngredientsIngredients: Kale*, Red Bell Pepper, Cashews*, Sesame Seeds*, Lemon Juice*, Nutritional Yeast, Himalayan Crystal Salt, Coconut Palm Sugar*, Paprika*, Chipotle Peppers*, Smoked Salt*. .. 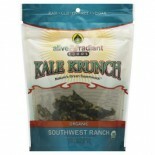 Attributes: Gluten Free, Natural or Organic Ingredients, VeganIngredients: Organic Kale, Organic Cashews, Organic Chia Seeds, Organic Lemon Juice, Nutritional Yeast, Spirulina, Himalayan Crystal Salt, Organic Maca Root. .. 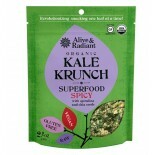 Attributes: Gluten Free, Natural or Organic IngredientsIngredients: Kale*, Cashew*, Red Bell Pepper, Lemon Juice*, Nutritional Yeast, Himalayan Crystal Salts and Blessings. .. Attributes: Dairy Free, Gluten Free, Natural or Organic IngredientsIngredients: Kale*, Cashew*, Lemon Juice*, Nutritional Yeast, Chickpea Miso*, Apple Cider Vinegar*, Habanero*, Garlic*, Spices* and Himalayan Crystal Salt. *Organic .. 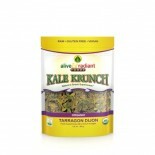 Attributes: Gluten Free, Natural or Organic Ingredients, VeganIngredients: Organic Kale, Organic Cashews, Organic Chia Seeds, Organic Lemon Juice, Nutritional Yeast, Spirulina, Himalayan Crystal Salt, Organic Turmeric, Organic Maca Root, Organic Cayenne. .. Attributes: Gluten Free, Natural or Organic IngredientsIngredients: Kale*, Cashews*, Sesame Seeds*, Apple Cider Vinegar*, Lemon Juice*, Mustard Powder*, Coconut Palm Sugar*, Nutritional Yeast, Himalayan Salt, Tarragon*, Tumeric*. .. 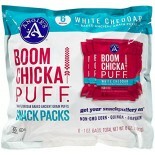 Attributes: Dairy Free, Gluten Free, Kosher, Natural or Organic Ingredients, Non-GMO Project Verified , Vegan, Wheat Free, Yeast FreeIngredients: Popcorn, Fair Trade Organic Evaporated Cane Juice, Sunflower Oil, Sea Salt.Nutritions: Calcium(0), Calories(120), Cholesterol(0), Dietaryfiber(3), Fromfat.. 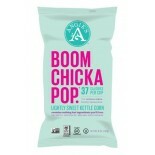 Attributes: Gluten Free, Kosher, Natural or Organic Ingredients, Non-GMO Project Verified , VeganIngredients: Popcorn, sunflower oil, sea salt. .. 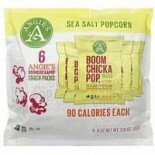 Attributes: Gluten Free, Kosher, Natural or Organic IngredientsIngredients: Popcorn, Sunflower Oil, Sea Salt. .. 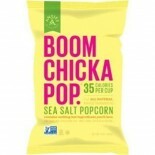 Attributes: Foodservice (Bulk Pack), Gluten Free, Kosher, Natural or Organic IngredientsIngredients: Popcorn, sunflower oil, sea salt. .. 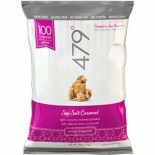 Attributes: Gluten Free, Kosher, Natural or Organic Ingredients, Non-GMO Project Verified , VeganIngredients: Popcorn, Sunflower Oil, Evaporated Cane Crystals, Sea Salt. .. 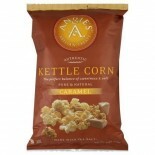 Attributes: Kosher, Natural or Organic Ingredients, Specialty ProductIngredients: Caramel Popcorn: Brown Sugar, Cane Sugar, Popcorn, Brown Rice Syrup, Butter (Sweet Cream, Natural Flavor), Sea Salt, Sunflower Oil, Sunflower Lecithin. 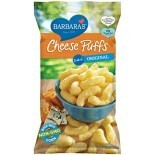 Cheese Popcorn: Popcorn, Sunflower Oil, Cheddar Cheese (Pasteurize.. 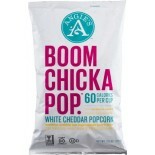 Attributes: Kosher, Natural or Organic IngredientsIngredients: Popcorn, Sunflower Oil, Whey, Cheddar Cheese (Cultured Milk, Salt, Enzymes), Non-Fat Milk, Sea Salt, Lactic Acid, Natural Flavor. 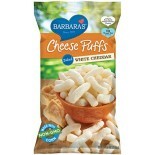 Nutritions: Calcium(8), Calories(150), Cholesterol(5), Dietaryfiber(3), Fromfat(80), Iron(4), Protein(3),.. 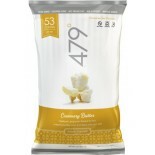 Attributes: Dairy Free, Kosher, Low Salt / Low Sodium / Reduced Sodium, Natural or Organic Ingredients, Non-GMO Project Verified , Vegan, Wheat Free, Yeast FreeIngredients: Popcorn, Sunflower Oil, Evaporated Cane Juice, Invert Cane Syrup, Natural Flavor, Sea Salt, Caramel and Annatto (Colors).Nutrit.. 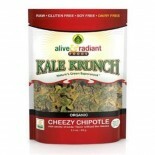 Attributes: Gluten Free, Kosher, Natural or Organic Ingredients, Vegan.. 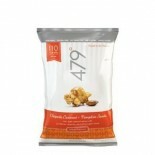 Attributes: Gluten Free, Kosher, Natural or Organic Ingredients, Non-GMO Project VerifiedIngredients: Popcorn, sunflower oil, dried cane sugar, sea salt, maltodextrin, vinegar powder (maltodextrin, white distilled vinegar), onion and garlic powder, tomato powder, spices, torula yeast, smoked paprika.. 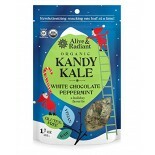 Attributes: Natural or Organic Ingredients, Non-GMO Project Verified , Specialty Product.. 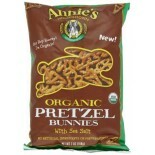 Attributes: Natural or Organic IngredientsIngredients: Organic Wheat Flour,Organic Expeller Pressed Vegetable Oil(Sunflower,Canola and or Safflower),Salt,Organic Valley Organic cheddar Cheese(Organic Pasteurized Milk,Cheese Culture,Salt,Non-Animal Enzymes),Organic Evaporated Cane Juice,Organic Barl.. 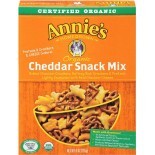 Attributes: Natural or Organic IngredientsIngredients: Organic Wheat Flour, Organic Expeller Pressed Vegetable Oil (Organic Sunflower, Organic Canola, Organic Safflower and/or Organic Soy), Sea Salt, Organic Valley® Organic Cheddar Cheese (Organic Pasteurized Milk, Cheese Culture, Salt, Non-animal E.. 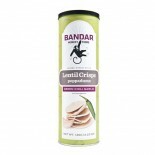 Attributes: Dairy Free, Specialty ProductIngredients: Lentil Flour, Rice Flour, Non-Hydrogenated Vegetable Palmolein Oil, Green Chili, Garlic, Salt, Baking Soda. .. 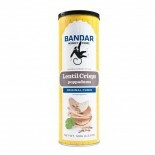 Attributes: Dairy Free, Specialty ProductIngredients: Lentil Flour, Rice Flour, Non-Hydrogenated Vegetable Palmolein Oil, Cumin Seeds, Salt, Baking Soda. .. 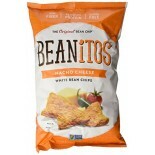 Attributes: Cholesterol Free, Natural or Organic Ingredients, Wheat FreeIngredients: Yellow cornmeal, expeller pressed high oleic canola oil, aged cheddar and blue cheese (milk gat, non-fat dry milk, slat, cheese cultures, enzymes), whey, buttermilk solids, sea salt, lactic acid, and spices (paprika.. 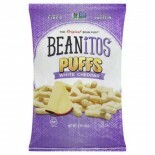 Attributes: Cholesterol Free, Gluten Free, Natural or Organic Ingredients, Wheat FreeIngredients: White cornmeal, expeller pressed high oleic canola oil, white cheddar cheese (cultured pasteurized milk, salt, enzymes), whey, dry buttermilk, salt, disodium phosphate, citric acid), sea salt, and lacti.. 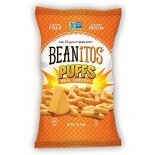 Attributes: Cholesterol Free, Low Salt / Low Sodium / Reduced Sodium, Natural or Organic Ingredients, Wheat FreeIngredients: Yellow cornmeal, expeller pressed high oleic canola oil, aged cheddar cheese (milk fat, non-fat milk, annatto extract, cheese culture, natural enzymes), whey, buttermilk, sea .. 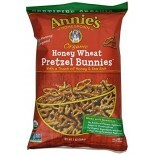 Attributes: Foodservice (Single Serve), Low Salt / Low Sodium / Reduced Sodium, Natural or Organic Ingredients, Wheat Free.. 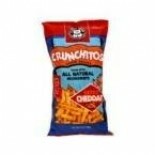 Attributes: Cholesterol Free, Low Salt / Low Sodium / Reduced Sodium, Natural or Organic Ingredients, Wheat FreeIngredients: YELLOW CORNMEAL, EXPELLER PRESSED HIGH OLEIC (CANOLA, SUNFLOWER OR SAFFLOWER) OIL, AGED CHEDDAR AND BLUE CHEESE (PASTEURIZED MILK, SALT, ANNATTO EXTRACT, CHEESE CULTURES, NAT.. 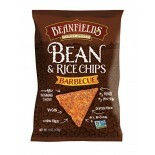 Attributes: Gluten Free, Kosher, Natural or Organic Ingredients, Non-GMO Project Verified , Specialty Product, VeganIngredients: Black Beans, Navy Beans, Long Grain Rice, High Oleic Safflower, Sunflower Oil. 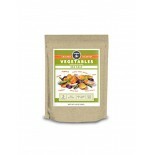 Flavoring: Tomato, Salt, Onion, Paprika, Garlic, Spices, Yeast Extract, Torula Yeast, Potat.. 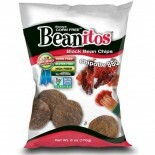 Attributes: Foodservice (Bulk Pack), Gluten Free, Kosher, Natural or Organic Ingredients, Non-GMO Project Verified , Specialty Product, Vegan, Yeast FreeIngredients: Black Beans, Navy Beans, Long Grain Rice, High Oleic Safflower, Sunflower Oil. Flavoring: Tomato, Salt, Onion, Paprika, Garlic, Spice.. 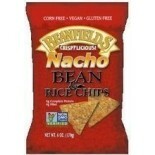 Attributes: Dairy Free, Gluten Free, Kosher, Natural or Organic Ingredients, Non-GMO Project Verified , Vegan, Wheat FreeIngredients: Black beans, navy beans, long grain rice, high oleic safflower or sunflower oil. 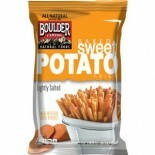 Flavoring: Potato maltodextrin, salt, tomato powder, cane sugar (vegan), onion powder.. 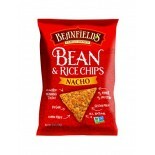 Attributes: Dairy Free, Gluten Free, Kosher, Natural or Organic Ingredients, Non-GMO Project Verified , Specialty Product, Vegan, Wheat FreeIngredients: Black Beans, Navy Beans, Long Grain Rice, High Oleic Safflower Or Sun- Flower Oil. 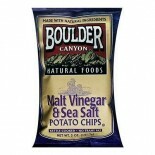 Flavoring: Potato Maltodextrin, Salt, Tomato Powder, Cane Sugar .. 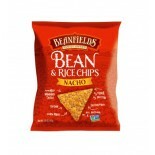 Attributes: Corn Free, Dairy Free, Gluten Free, Kosher, Natural or Organic Ingredients, Non-GMO Project Verified , Vegan, Wheat Free, Yeast FreeIngredients: Navy Beans, Black Beans, Long Grain Rice, Cold Pressed High Oleic Safflower Or Sunflower Oil. 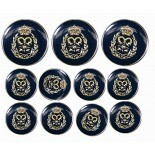 This product was manufactured on shared equipm.. 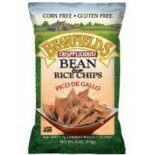 Attributes: Dairy Free, Gluten Free, Kosher, Natural or Organic Ingredients, Non-GMO Project Verified , Specialty Product, Vegan, Wheat FreeIngredients: Black Beans, Navy Beans, Long Grain Rice, High Oleic Safflower Or Sunflower Oil. 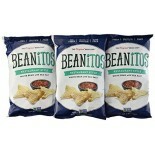 Flavoring: Sea Salt, Torula Yeast, Spices, Onion Powder, Tomato Po.. 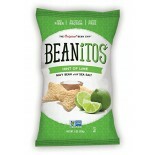 Attributes: Corn Free, Dairy Free, Gluten Free, Kosher, Natural or Organic Ingredients, Non-GMO Project Verified , Vegan, Wheat FreeIngredients: Navy Beans, Black Beans, Long Grain Rice, Cold Pressed High Oleic Safflower or Sunflower Oil, Flavoring: Tortilla Yeast, Sea Salt, Spices, Onion Powder, To.. 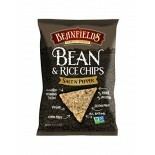 Attributes: Gluten Free, Kosher, Natural or Organic Ingredients, Non-GMO Project Verified , Specialty Product, Vegan, Yeast FreeIngredients: Black Beans, Navy Beans, Long Grain Rice, High Oleic Safflower, Sunflower Oil. 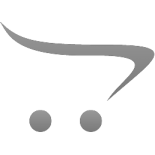 Flavoring: Salt, Gum Arabic, Tapioca Maltodextrin, Onion, Tomato, Spices, Musta.. 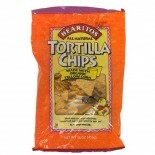 Attributes: Foodservice (Bulk Pack), Gluten Free, Kosher, Natural or Organic Ingredients, Non-GMO Project Verified , Specialty Product, Vegan, Yeast FreeIngredients: Black Beans, Navy Beans, Long Grain Rice, High Oleic Safflower, Sunflower Oil. 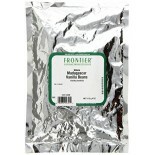 Flavoring: Salt, Gum Arabic, Tapioca Maltodextrin, Oni.. 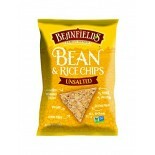 Attributes: Corn Free, Dairy Free, Gluten Free, Kosher, Natural or Organic Ingredients, Non-GMO Project Verified , Vegan, Wheat Free, Yeast FreeIngredients: Navy Beans, Black Beans, Long Grain Rice, Cold Pressed High Oleic Safflower or Sunflower Oil, Sea Salt. This product was manufactured on sha.. 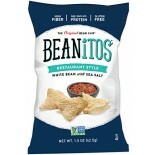 Attributes: Dairy Free, Kosher, Natural or Organic Ingredients, Non-GMO Project Verified , Specialty Product, Vegan, Wheat Free, Yeast FreeIngredients: Black Beans, Navy Beans, Long Grain Rice, High Oleic Safflower or Sunflower Oil, Sea Salt. 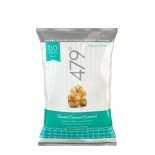 Nutritions: Calcium(4), Calories(140), Cholesterol(0), D.. Attributes: Corn Free, Dairy Free, Gluten Free, Kosher, Natural or Organic Ingredients, Non-GMO Project Verified , Specialty Product, Vegan, Wheat Free, Yeast FreeIngredients: Navy Beans, Black Beans, Long Grain Rice, Cold Pressed High Oleic Safflower or Sunflower Oil. 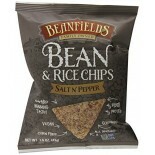 Flavoring: Sea Salt, Black Pep.. 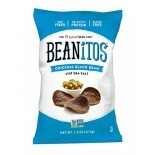 Attributes: Dairy Free, Gluten Free, Kosher, Natural or Organic Ingredients, Non-GMO Project Verified , Specialty Product, Vegan, Wheat Free, Yeast FreeIngredients: Black Beans, Navy Beans, Long Grain Rice, High Oleic Safflower Or Sunflower Oil. 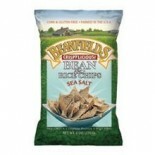 Flavoring: Sea Salt, Black Pepper, Evaporated Cane Jui.. 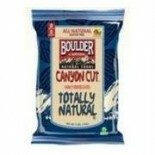 Attributes: Corn Free, Gluten Free, Kosher, Natural or Organic Ingredients, Non-GMO Project Verified , Wheat FreeIngredients: Whole Black Beans, Whole Grain Rice (Brown and/or Long Grain White), Pure Sunflower or Safflower Oil, Salt, Raw Powdered Brown Sugar, Tomato Powder, Torula Yeast, Paprika, Ra.. 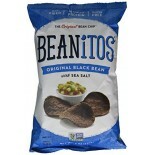 Attributes: Cholesterol Free, Corn Free, Gluten Free, Kosher, Low Carb, Low Salt / Low Sodium / Reduced Sodium, Natural or Organic Ingredients, Non-GMO Project Verified , Soy Free, Wheat Free, Yeast FreeIngredients: Whole Black Beans, Whole Grain Rice (Brown and/or Long Grain White), Pure Sunflower .. 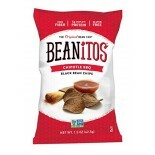 Attributes: Cholesterol Free, Corn Free, Dairy Free, Gluten Free, Kosher, Natural or Organic Ingredients, Non-GMO Project Verified , Soy Free, Wheat FreeIngredients: Whole Black Beans, Whole Grain Rice (Brown and/or Long Grain White), Pure Sunflower or Safflower Oil, Bean Gum, Sea Salt. Allergy I.. 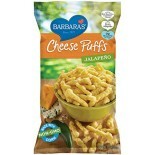 Attributes: Gluten Free, Kosher, Natural or Organic Ingredients, Non-GMO Project Verified , Wheat FreeIngredients: Whole navy beans, whole grain rice, pure sunflower and/or safflower oil, cheddar cheese blend [cheddar cheese (pasteurized milk, cheese cultures, salt, enzymes), whey, buttermilk, annat.. 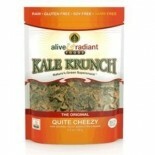 Attributes: Gluten Free, Kosher, Natural or Organic Ingredients, Wheat FreeIngredients: Whole navy beans, whole grain rice, pure sunflower and/or safflower oil, cheddar cheese blend [cheddar cheese (pasteurized milk, cheese cultures, salt, enzymes), whey, buttermilk, annatto], sea salt, tomato powde.. 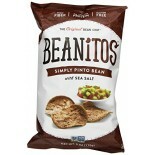 Attributes: Gluten Free, Natural or Organic IngredientsIngredients: garlic, salt, vinegar, cornstarch.. 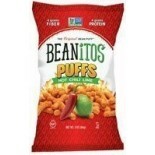 Attributes: Cholesterol Free, Corn Free, Dairy Free, Gluten Free, Kosher, Natural or Organic Ingredients, Non-GMO Project Verified , Soy Free, Wheat FreeIngredients: WWhole Pinto Beans, Whole Brown Flaxseeds, Whole Grain Rice (Brown and/or Long Grain White), Pure Sunflower or Safflower Oil, Guar Bea.. 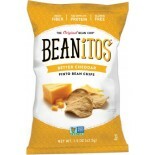 Attributes: Cholesterol Free, Corn Free, Gluten Free, Kosher, Natural or Organic Ingredients, Non-GMO Project Verified , Soy Free, Wheat FreeIngredients: Whole Pinto Beans, Whole Brown Flaxseeds, Whole Grain Rice(Brown and/or Long Grain White), Pure Sunflower or Safflower Oil, Cheddar cheese blend [.. 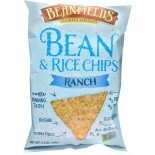 Attributes: Gluten Free, Kosher, Natural or Organic Ingredients, Non-GMO Project Verified , Vegan, Wheat FreeIngredients: Whole navy beans, whole grain rice, pure sunflower and/or safflower oil, guar bean gum, sea salt. .. 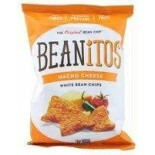 Attributes: Gluten Free, Natural or Organic Ingredients, Non-GMO Project VerifiedIngredients: Whole Navy Beans, Long Grain Rice, Sunflower Oil, Tapioca, Cheddar Cheese Blend [Cheddar Cheese (Pasteurized Milk, Cheese Cultures, Salt, Enzymes), Whey, Buttermilk, Sea Salt, Annatto], Whey, Sea Salt, Lact.. 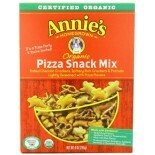 Attributes: Natural or Organic IngredientsIngredients: Organic cornmeal, expeller pressed corn oil, whey, cheddar cheese (pasteurized milk, cheese cultures, salt, enzymes), salt, autolyzed yeast extract, annatto and turmeric extracts (for color), lactic acid, citric acid, natural flavor.Nutritions: .. 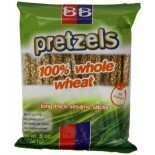 Attributes: Kosher, Natural or Organic Ingredients, Non-GMO Project VerifiedIngredients: Organic yellow corn, expeller pressed canola oil, and/or sunflower oil and sea salt.Nutritions: Calcium(2), Calories(140), Cholesterol(0 g), Dietaryfiber(2), Fromfat(60), Iron(0), Protein(2), Saturatedfat(1), Se.. 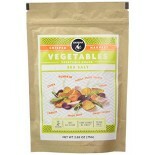 Attributes: Gluten Free, Natural or Organic Ingredients, Non-GMO Project VerifiedIngredients: Chick Peas, Sunflower Oil, Habanero Seasoning (Salt, Tomato Powder, Onion Powder, Evaporated Cane Sugar, Garlic Powder, Dehydrated Lemon Peel, Habanero Pepper, Black Pepper, Cumin, Citric Acid, Lemon Oil).. 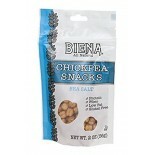 Attributes: Dairy Free, Kosher, Natural or Organic Ingredients, Non-GMO Project Verified , Specialty Product, Vegan, Wheat Free, Yeast FreeIngredients: Chickpeas, Brown Rice Syrup, Sea Salt, Evaporated Cane Juice, Sunflower Oil, Gum Arabic, Sunflower Lecithin, Yeast Extract, Paprika, Onion Powder, T.. 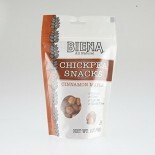 Attributes: Dairy Free, Kosher, Natural or Organic Ingredients, Non-GMO Project Verified , Specialty Product, Vegan, Wheat Free, Yeast FreeIngredients: Chickpeas, Pure Cane Sugar, Maple Syrup, Sunflower Oil, Gum Arabic, Sea Salt, Cinnamon, Sunflower Lecithin, Vitamin E. .. Attributes: Dairy Free, Kosher, Natural or Organic Ingredients, Non-GMO Project Verified , Specialty Product, Vegan, Wheat Free, Yeast FreeIngredients: Chickpeas, Pure Cane Sugar, Honey, Sunflower Oil, Gum Arabic, Sunflower Lecithin, Honey Powder, Sea Salt, Vitamin E. .. 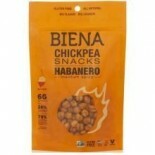 Attributes: Dairy Free, Kosher, Natural or Organic Ingredients, Non-GMO Project Verified , Specialty Product, Vegan, Wheat Free, Yeast FreeIngredients: Chickpeas, Brown Rice Syrup, Sea Salt, Sunflower Oil, Gum Arabic, Sunflower Lecithin, Vitamin E. .. 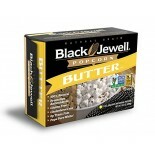 Attributes: Gluten Free, Kosher, Low Carb, Low Salt / Low Sodium / Reduced Sodium, Natural or Organic Ingredients, Non-GMO Project Verified , Specialty Product, Vegan, Wheat FreeIngredients: Black popcorn, palm oil, salt, natural and artificial butter flavors, beta carotene, citric acid. Contains.. Attributes: Gluten Free, Kosher, Low Carb, Non-GMO Project Verified , Specialty Product, Vegan, Wheat FreeIngredients: Black popcorn, palmoil, salt, citric acid.Nutritions: Calcium(0), Calories(130), Cholesterol(0), Dietaryfiber(5), Fromfat(40), Iron(4), Protein(3), Saturatedfat(1), Servingscontaine.. 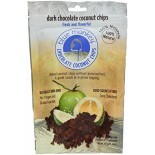 Attributes: Natural or Organic IngredientsIngredients: Coconut, Cocoa Powder .. 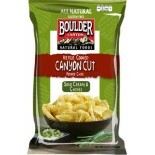 Attributes: Natural or Organic IngredientsIngredients: Coconut, Wasabi seasoning, Soybean Oil from Thailand-GMO Free .. 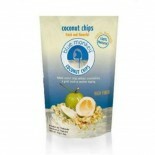 Attributes: Dairy Free, Natural or Organic Ingredients, VeganIngredients: Coconut, cane sugar, salt. .. 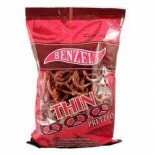 Attributes: Gluten Free, Natural or Organic Ingredients, VeganIngredients: corn meal, sunflower oil, sweet potato powder, sugar, salt, brown sugar, rice flour, molasses powder, whey, caramel color, natural flavors, extractive of paprika, calcium carbonate. .. 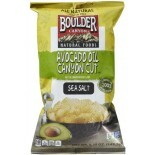 Attributes: Gluten Free, Kosher, Natural or Organic Ingredients, Non-GMO Project Verified , VeganIngredients: Potatoes, avocado oil, sea salt. 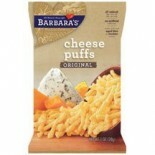 Nutritions: Calcium(0), Calories(140), Cholesterol(0), Dietaryfiber(1), Fromfat(60), Iron(2), Protein(2), Saturatedfat(1), Servingscontainer(About 5), Ser.. 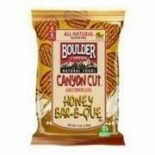 Attributes: Gluten Free, Natural or Organic IngredientsIngredients: POTATOES, SUNFLOWER AND/OR SAFFLOWER OIL, SALT, SUGAR, DEXTROSE, TOMATO POWDER, DRIED HONEY (HONEY, EVAPORATED CANE JUICE), BROWN SUGAR, SPICES, YEAST EXTRACT, ONION POWDER, NATURAL FLAVORS, PAPRIKA EXTRACTS, CARAMEL COLOR, CITRIC A.. 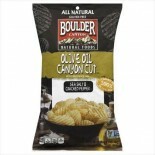 Attributes: Gluten Free, Kosher, Natural or Organic Ingredients, Non-GMO Project Verified , VeganIngredients: potatoes, olive oil, rice flour, evaporated cane juice, salt, spices, garlic powder, onion powder, yeast extract, spice extract. .. 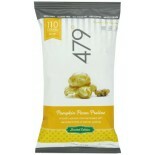 Attributes: Gluten Free, Natural or Organic IngredientsIngredients: POTATOES, SUNFLOWER AND/OR SAFFLOWER OIL, WHEY POWDER, NON FAT MILK, DRIED SOUR CREAM (CULTURED CREAM, NON FAT MILK), RICE FLOUR, ONION POWDER, MALTODEXTRIN, SALT, EVAPORATED CANE JUICE, DRIED PARSLEY, CITRIC ACID, NATURAL FLAVORS, .. 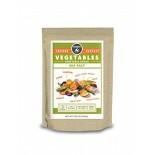 Attributes: Gluten Free, Kosher, Natural or Organic Ingredients, Non-GMO Project VerifiedIngredients: POTATOES, SUNFLOWER AND/OR SAFFLOWER OIL, SEA SALT. .. 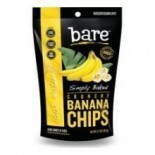 Attributes: Gluten Free, Natural or Organic Ingredients, VeganIngredients: Potatoes, avocado oil, malt vinegar powder (maltodextrin, modified food starch, malt vinegar), white vinegar powder (maltodextrin, distilled white vinegar), sea salt, fructose, maltodextrin, citric acid, malt extract. Nutriti..